Thanks guys! However, I still cannot access the update manager OR add-remove after using the command “yaourt pacman” and entering Option 1. When I click on either icon I get the following error message…see image below! 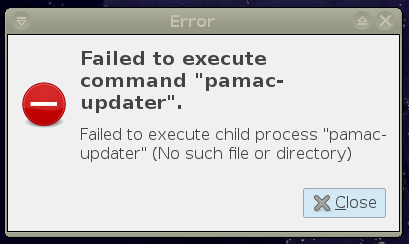 Failed to execute command “pamac-updater”. @herbie I tried your suggestion and it did not work. Have you misspelled the commands? ==> ERROR: PKGBUILD does not exist. I have the same problem and cannot use my update manager…it just hangs. Can someone please explain in simple terms on how to fix this?? I don’t understand the above explanation on how to fix this or it does not seem clear to me. Your solution worked for me! I had the same issue in Gnome, just sharing to alert and thanks for the help!! !